Both Vipers and Craiova had already written history be reaching their first European cup final, but obviously each team was determined to make the last step. The first leg match in Kristiansand was exciting, yet hardly anything is clear after Vipers' 26:22 win - the Norwegian side now hope to defend their advantage next week, while SCM certainly have a chance for a home revenge. Since the opening minute, it was a tight game in which both rivals did not convert their chances too well. Craiova, who had surprisingly won at Lada and Kastamonu in the previous play-off away matches, felt quite confident in Kristiansand and enjoyed a better start. Thanks to Yuliya Dumanska's saves and the inspiration of Cristina Florianu, who scored Craiova's three opening goals of the game, the Romanian side enjoyed a better start and led 4:2 ten minutes into the match. 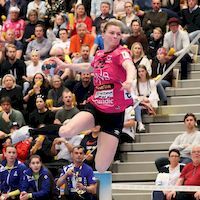 However, Vipers improved their defence, as Katrine Lunde once again showed her quality in the goal, and the home side scored a few goals from fast breaks. Jeanett Kristiansen, who scored six times from seven attempts in the first half, helped the Norwegian side to turn the tide, and they moved the score from 6:6 to 10:6 between the 20th and 24th minute. The last minutes before the break saw SCM trying to come back, and they had some success as Vipers' advantage was reduced to just two goals at half-time (12:10). Early in the second half, the hosts somewhat stuggled in attack, and Craiova drew level at 16:16 at some point. But then the Norwegian side woke up and, supported by home crowd, improved their game. Notably Linn Jorum Sulland, who had missed a few shots in the first half, started to played more efficiently and finished the game with eight goals, just one fewer than Kristiansen, so altogether this duo accounted for 17 of 26 team's goals. Thanks to their effort, Vipers pulled clear at 24:19, then 26:21, and all Craiova could do was to slightly cut the deficit.